From Gerald Ford's football days to Barack Obama's basketball game to George W. Bush's impressive marathon splits, many presidents have shown athletic prowess. From George Washington, who was a skilled horseman, to Donald Trump, whose longtime passion is golf, most U.S. presidents played various sports in their youth, and many continued their athletic pursuits while in the White House. “Presidents tend to be extraordinarily competitive,” explains Curt Smith, a former speechwriter in the George H.W. Bush White House and author of the 2018 book The Presidents and the Pastime: A History of Baseball & the White House. A sporting event and a political campaign tend to have comparable ups and downs, he says, so it’s only natural that the same sort of personality would be drawn to both. “They both demand that you marshal all of your resources—intellectual, physical, moral and spiritual,” he says. A president’s choice of physical pastimes often reveal a lot about character and leadership style, says John Sayle Watterson, author of The Games Presidents Play: Sports and the Presidency (2006). 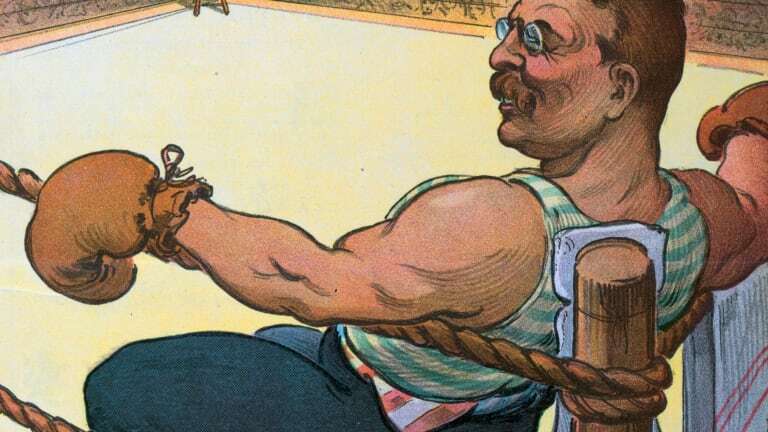 After a sickly childhood, Teddy Roosevelt determinedly built up his body with vigorous exercise. 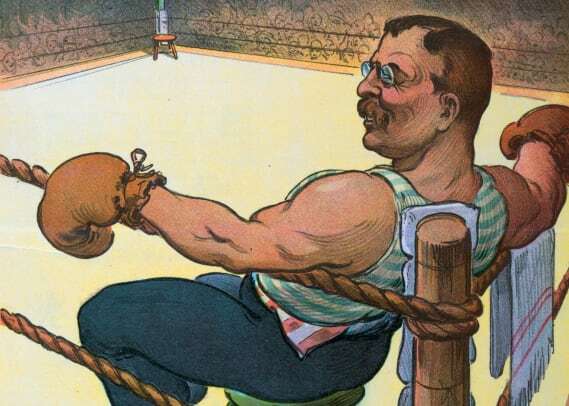 As a college student, according to a 1957 Harvard Crimson article, Roosevelt began entering in boxing tournaments, where he made up in fierceness and ability to withstand punishment what he lacked in skill. Even after becoming president, Roosevelt engaged in sparring sessions with some of his White House aides and other opponents. 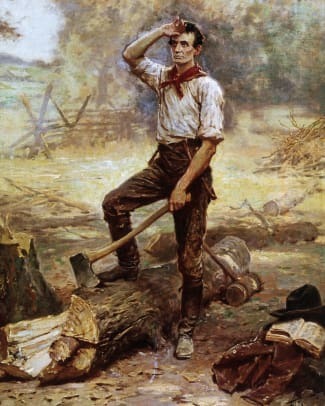 In Roosevelt’s autobiography, he recalled that the White House fight club came to an end after he squared off with a young Army artillery captain, who countered one of Roosevelt’s punches and gave him a permanent eye injury. “The sight has been dim ever since,” Roosevelt admitted. “Accordingly, I thought it better to acknowledge that I had become an elderly man and would have to stop boxing.” But not one to give up combat sports completely, Roosevelt then switched to learning the Japanese martial art of jiu-jitsu. FDR swimming in the pool at his Hyde Park home in 1932. As a prep school student, the physically-slight young FDR had more success as a debater than as a second-string member of the football team, and sometimes inflated his athletic resume with fictitious exploits as a boxer or distance runner. At Harvard, he rowed for one of the school’s crew clubs. But though he wasn’t a great competitive athlete, Roosevelt would become known as a swimmer for a different reason. 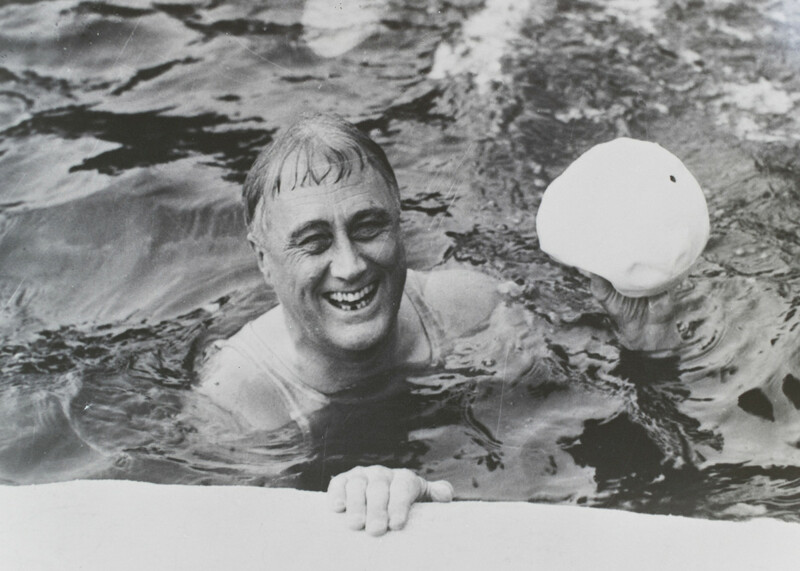 After being stricken with polio and losing his ability to walk at age 39, the future president realized that water could support his weakened body, and began swimming three times a week in order to rebuild himself enough to resume his political career, according to the FDR Library website. It worked. Within a few months, his arms, stomach and lower back had regained the strength that enabled him to hang onto a speaking podium and to move short distances with the help of a cane and the steadying arm of an aide. After Roosevelt was elected president, the New York Daily News held a fundraising drive to build him a small 50-foot-long pool inside the White House, so that he could continue to get his exercise, according to the White House Historical Association. 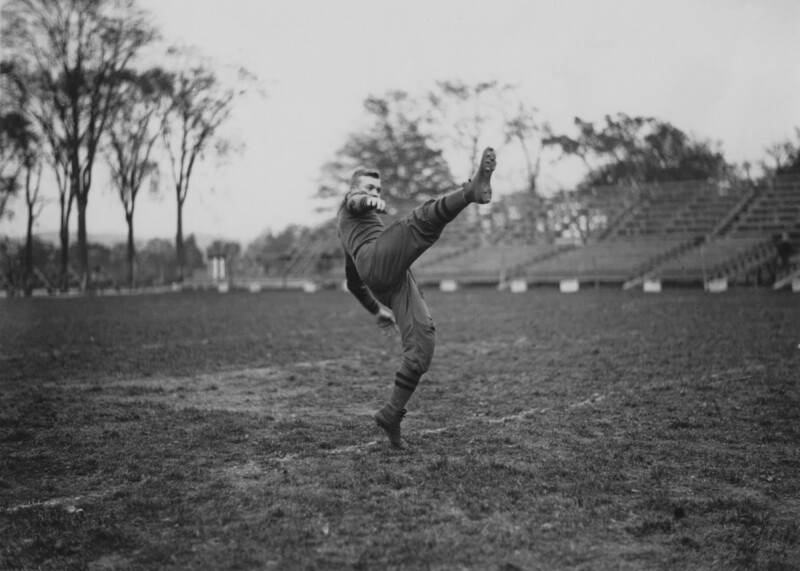 A young Dwight D. Eisenhower on the football field during his time as a military cadet at West Point Academy, New York, 1912. Long before he achieved acclaim as the leader of the Allied forces who defeated Hitler, Dwight Eisenhower made a name for himself as a halfback and linebacker on the varsity football team at West Point. In November 1912, Eisenhower played in a game against the Carlisle Indian School, whose star was one of the most renowned athletes of all time, Jim Thorpe, who just a few months previously had won the decathlon and pentathlon at the Olympic Games in Stockholm. According to Lars Anderson’s book-length account of the game, Eisenhower dreamed of hitting Thorpe hard enough to knock him out of the contest with a hard tackle, and late in the game, took his best shot—only to have Thorpe get up and shake off the hit. Carlyle ended up winning the game, 27-6, and Eisenhower suffered a knee injury that nearly cut short his military career. According to Watterson, Eisenhower later become a well-regarded football coach at various Army bases. “He was in great demand,” the sports historian says. 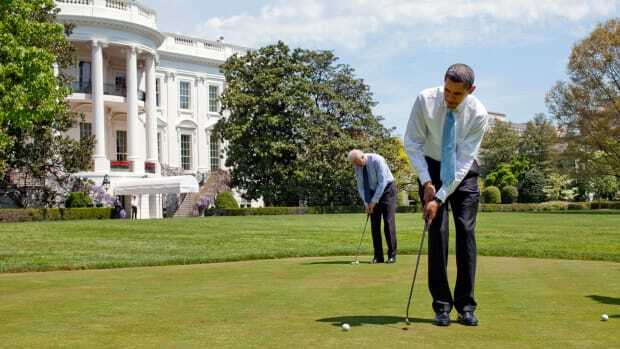 “He finally had to stop, because he didn’t want to be known just as a coach.” As President, Eisenhower’s sporting passion was golf, and he actually had a putting green installed on the White House lawn so that he could take a break from working to practice. 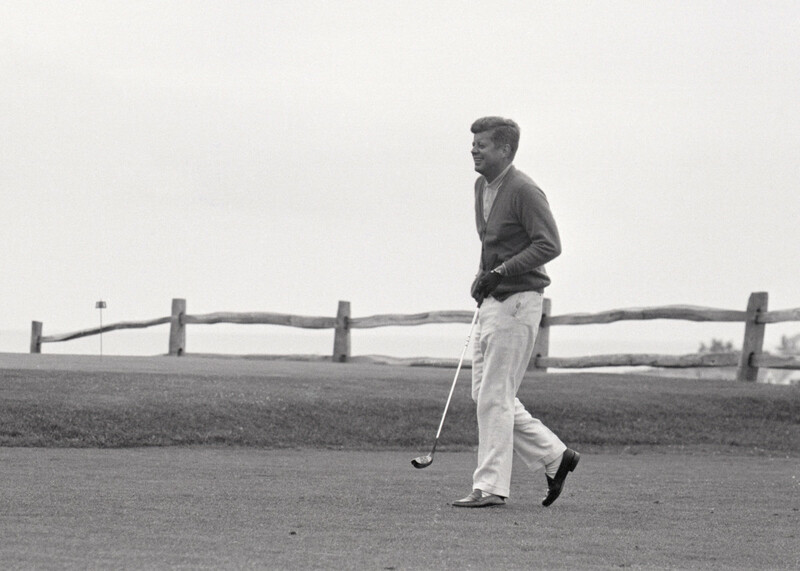 President Kennedy playing golf at Hyannisport Club, 1963. JFK played left end and tackle on the football team at Choate Hall, his prep school, and swam on the varsity team at Harvard, according to Sports Illustrated. 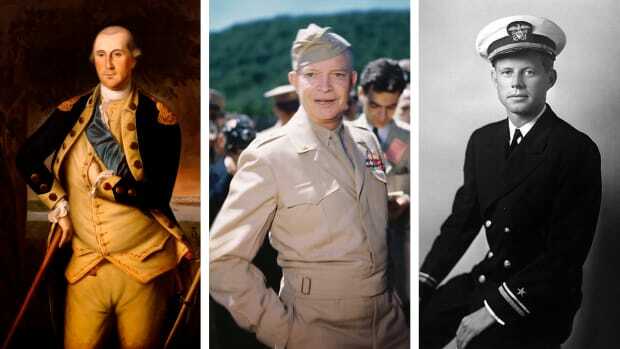 Slim and square-shouldered, he might have been the president who looked the most fit, even though in reality he was plagued with health problems, including Addison’s disease and often-severe back pain. JFK’s best sport may have been golf. JFK also loved watching sports and appearing at sporting events. At the Army-Navy football game, Smith says, Kennedy would spend the first half sitting on the Army side and then switch at halftime. “The midshipmen would chant, ‘Welcome home!’” he says. Kennedy also was known for his devotion to the Boston Red Sox. 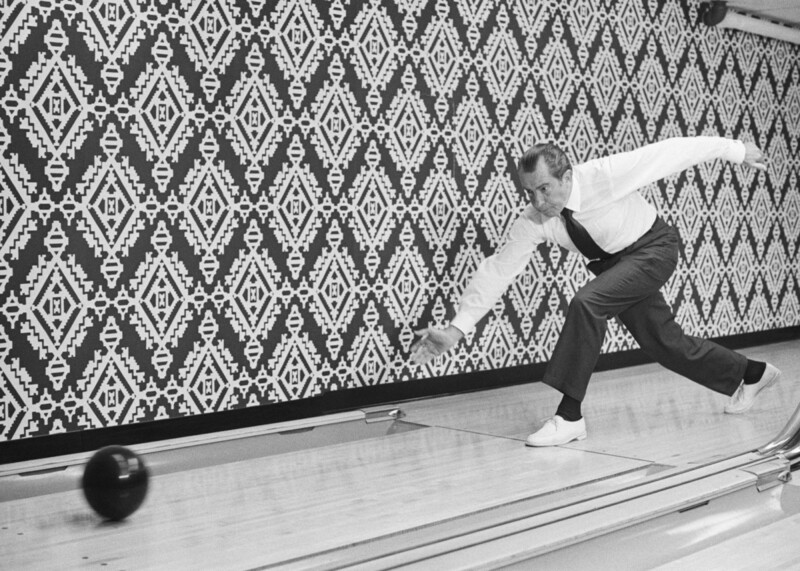 President Nixon bowling at Executive Office Bowling Alley, 1971. Throughout his life, he remained a devoted fan of the game, and as president, by some accounts, he gave his friend, Washington Redskins coach George Allen, a play to run in the 1973 Super Bowl, according to the Nixon Foundation website. But Nixon became more famous as a bowler. He installed a single-lane bowling alley in the White House, and he and his wife, Pat, both used it regularly, according to Smith, who knew Nixon and describes him as proficient at the game. A young Gerald Ford, wearing his uniform on the football field at the University of Michigan, 1933. While Gerald Ford was mocked on Saturday Night Live for his supposed clumsiness, in reality he was one of the best athletes ever to sit in the Oval Office, and one of the most physically-fit presidents as well. As the Baltimore Sun reported in this 2006 profile of his athletic career, Ford played center and linebacker for a University of Michigan football team that won two national championships, and after graduation turned down offers from the National Football League’s Detroit Lions and Green Bay Packers. 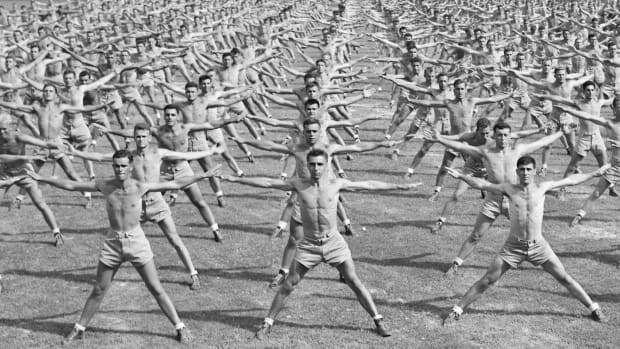 As a Navy officer during World War II, he did a stint as a physical fitness instructor for pilots. After taking over the presidency at age 61 when Richard Nixon resigned in 1974, Ford worked out in the swimming pool on a daily basis, and also skied and played tennis. As a golfer, he did become the subject of jokes after he inadvertently hit balls into the gallery. On one occasion, he even struck a spectator in the head with a shot, according to the New York Times. 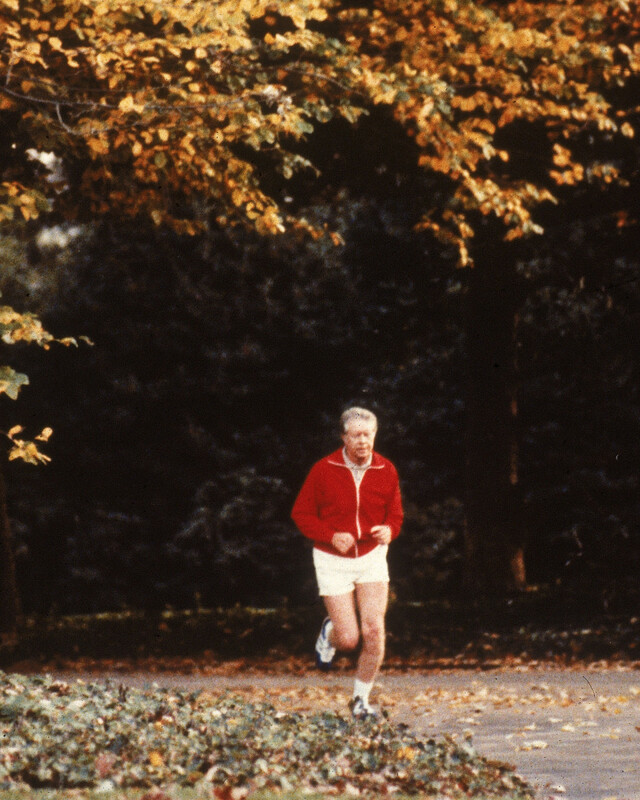 President Jimmy Carter out for a jog in 1978. Not many Americans may have thought of Jimmy Carter as an athlete. But, according to Watterson, Carter played on his high school tennis and basketball teams, competed in track and field as a pole vaulter, and played American Legion baseball. Later, he ran on the cross-country squad at the U.S. Naval Academy. As president, he continued to play tennis and occasionally golfed, but his real passion was for outdoor sports. While at the presidential retreat at Camp David, he fished in trout streams and became skilled at tying flies, and on trips back to Georgia, he hunted quail and hiked in the woods. A Yale baseball card (reissued), showing George H.W. 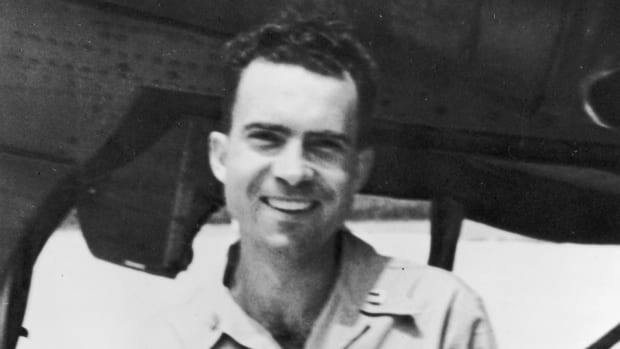 Bush in 1947. George H.W. Bush’s first love was baseball. 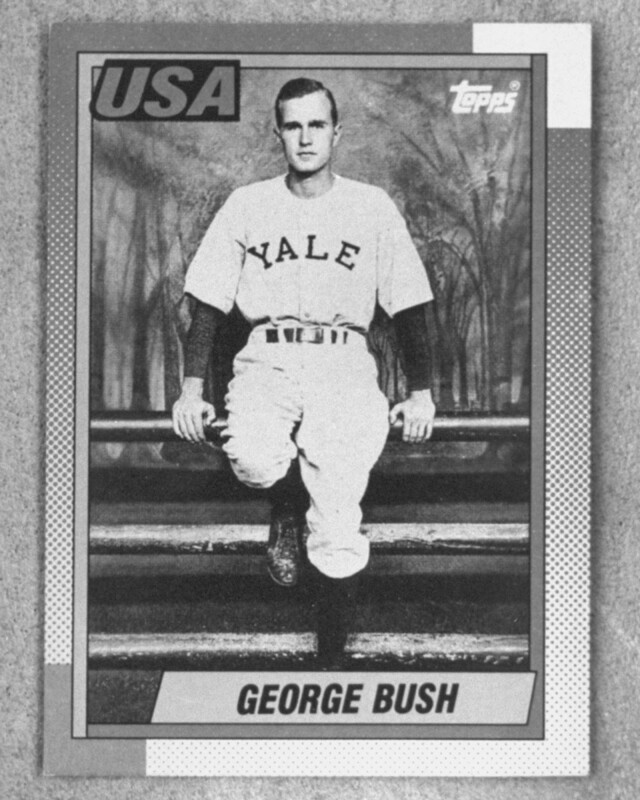 After returning from service in World War II, Bush played first base for Yale University teams that twice made the College World Series. Though a mediocre hitter, Bush but was the team’s best fielder, compiling a .992 fielding percentage in 1948, according to Yalebulldogs.com. Smith, who worked for the 41st president, thinks he may have been the best all-around athlete ever to sit in the Oval Office. “Sailing, skydiving, horseshoes, fishing, tennis and golf—you name the sport, and he was good at it,” Smith says. 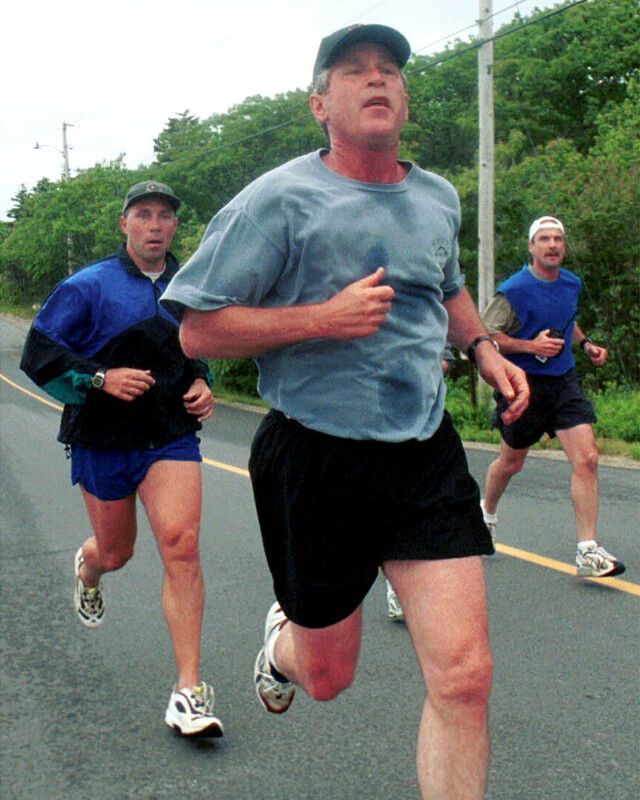 George W. Bush taking an early morning jog with secret security agents before a round of golf, 2000. Like his father, George W. Bush played baseball at Yale, but wasn’t as good at it. He made the freshman squad as a relief pitcher, but only got into three games, and stuck to intramural sports for the rest of his college career, as ESPN.com details. His best sport turned out to be running, which he took up in 1972 to get back in shape. 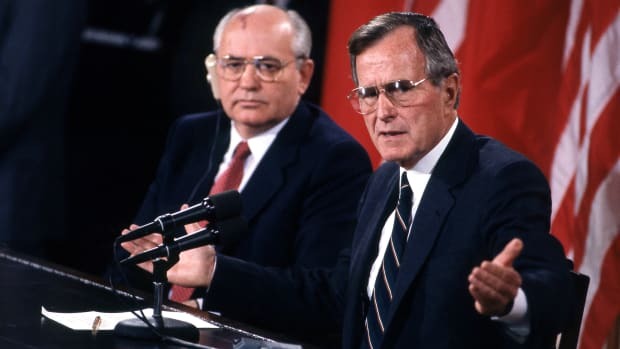 Bush finished the Houston Marathon in 1993 in 3:44:52, an approximately 8:30-mile pace, and, as president in 2002, did a three-mile race in 20:29—an impressive pace (sub 7-minute miles) for a 55-year-old. A Wall Street Journal article by former Secret Service agent Dan Emmett described Bush as “not a jogger but an honest-to-God runner,” and noted that few agents could keep up with him when he ran at Camp David or the Secret Service training center in Beltsville, Md. As president, he also took up mountain biking. 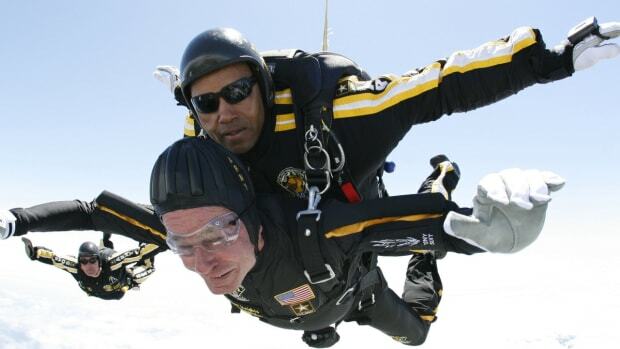 After he left office in 2009, he began hosting the Warrior 100-K, a mountain bike event in which service members who had been wounded in action were invited to join him at his ranch in Texas. 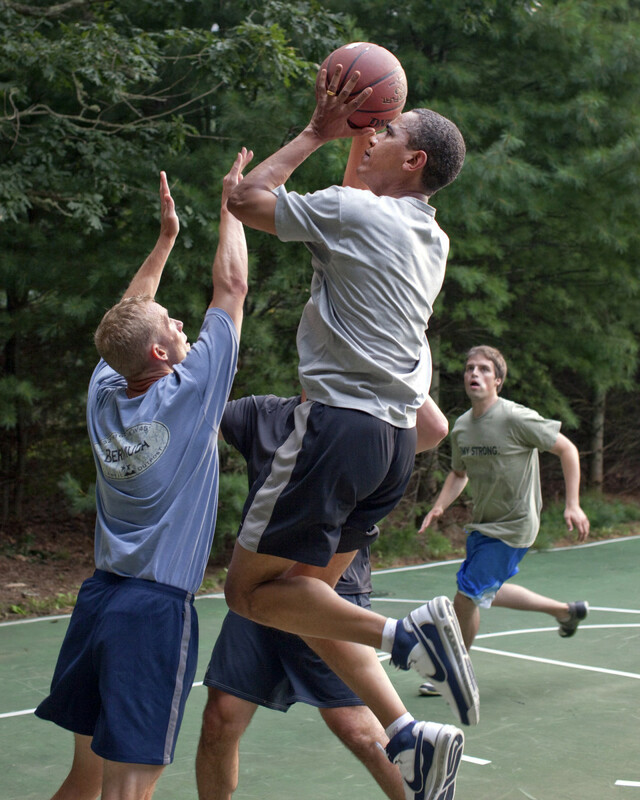 President Barack Obama playing basketball while on vacation at Martha&apos;s Vineyard in 2009. The 44th president developed a passion for basketball while he was an adolescent in Hawaii, playing pickup games every day on an outdoor court at his school, according to David Maraniss’s biography, Barack Obama: The Story. Barack Obama, a left-handed small forward, was good enough to make his high school’s state championship team in 1979. But he became more famous his performances as president in highly competitive pickup games that included his aide, Reggie Love, who played at Duke, and Secretary of Education Arne Duncan, who was captain of the varsity team at Harvard. In a 2017 interview with USA Today, Duncan described Obama as a smart, skilled player—“very crafty, very deceptive, will cut back door on you, has a very good crossover dribble.